With Apocalypse slated for a return within the pages of X-Force soon, let us reflect back on his first appearance. 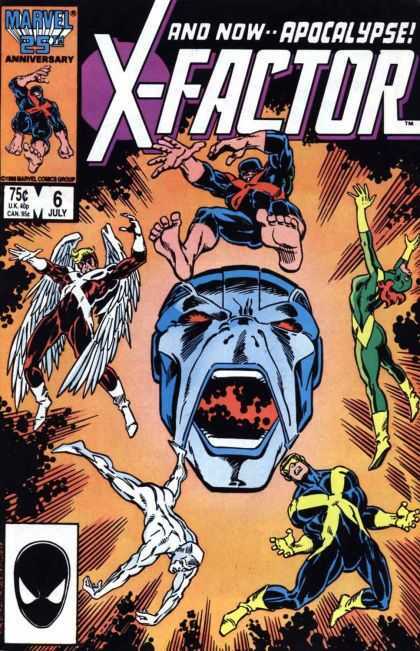 In July 1986, the mutant villain known as Apocalypse made his debut in X-Factor #6. Written by Louise Simonson and drawn by Jackson Guice, X-Factor # 6 features the original X-Men lineup aka X-Factor ( Beast, Iceman, Cyclops, Marvel Girl) going head to head with the most powerful and twisted mutant they could imagine. In the issue, Apocalypse is introduced as a centuries-old mutant obsessed with the Social Darwinism philosophy of survival of the fittest. At the time, I doubt Marvel had much stock in the character , but thru the years he has become a popular villain in the X-Men cannon. In addition, The Age of Apocalypse alternate universe, Marvel released in 1995, is considered one of the best crossover storylines the X titles have seen to date. Of course, for a collector of Marvel Comics the value of this issue is priceless, but if you can find a high-graded copy the dollar value is somewhere in the neighbourhood of $ 10. Pretty cheap, and I suspect this issue is only going to increase in value in the coming months. Find it now, and enjoy!